Transplanting forsythia is a good idea if the perennial has overgrown the original planting area. This task needs some care. 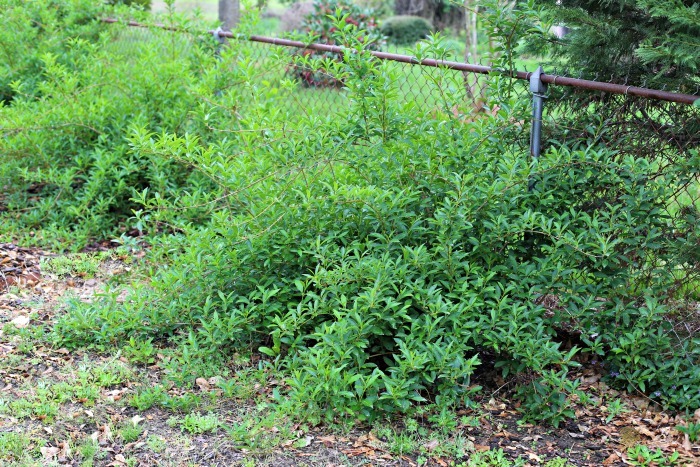 These tips for moving forsythia bushes will help with the project. Forsythia shrubs are hardy bushes that are easy to grow and a real show stopper in early spring when their yellow flowers tell us that the warm weather is on the way. 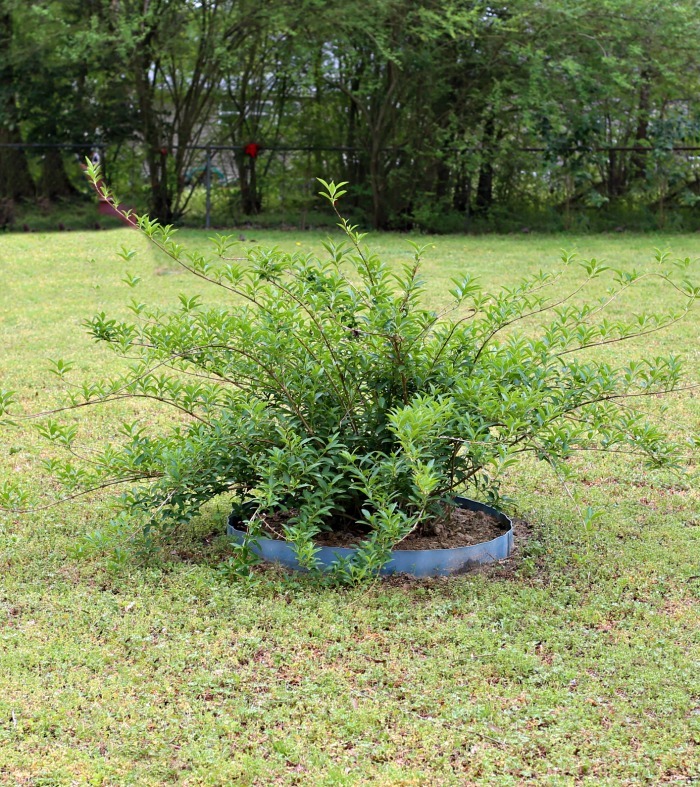 With some normal pruning practices, the bushes will delight year after year. These shrubs are quite easy care, but some thought must be given to where you place them when planting forsythia. 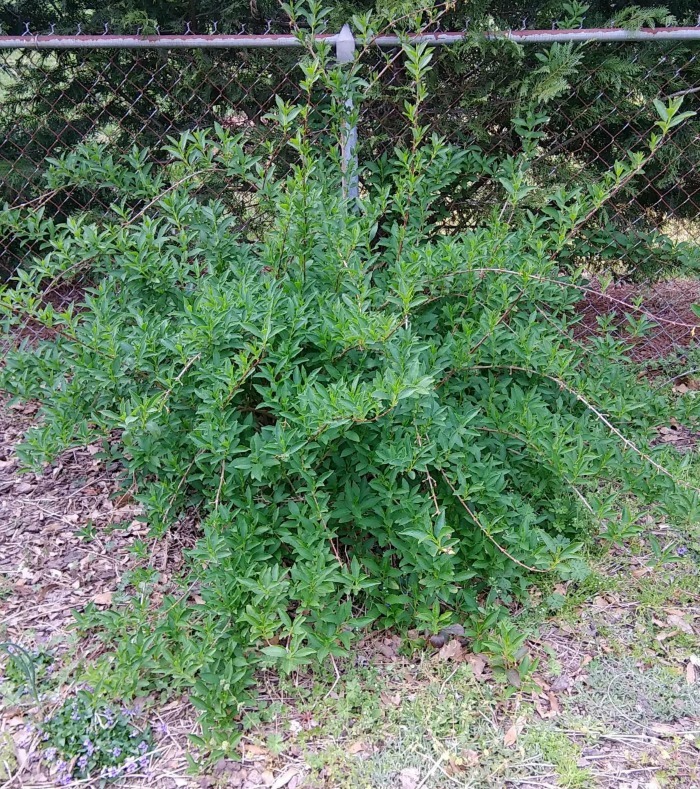 Since the shrub will grow up to 10 feet tall over time, it can easily outgrow its original spot. You can even end up with a forsythia tree if you aren’t careful. 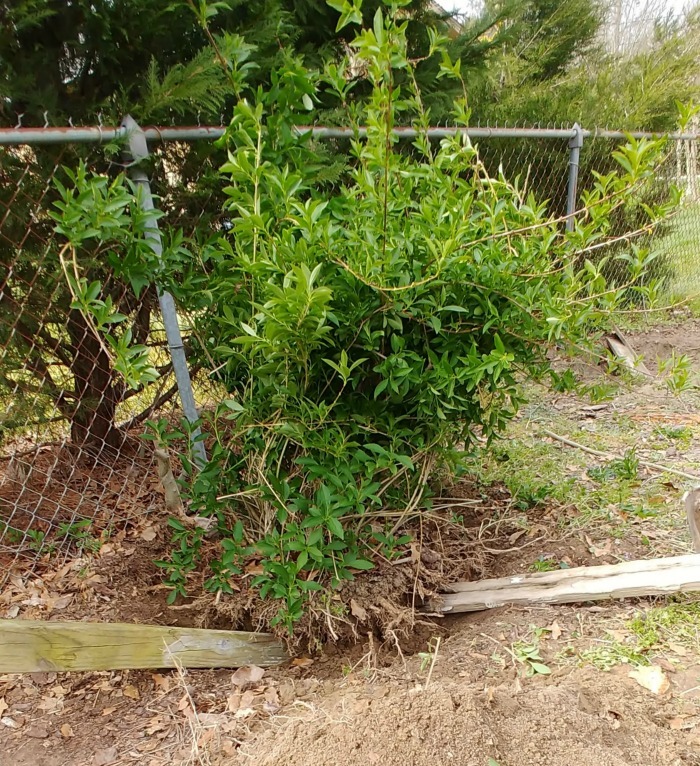 When this happens, you can try renovation pruning to get it back to a more manageable size, or decide to move the whole shrub to a better spot. Last year, I made one garden bed much smaller. Unfortunately, the original bed had forsythia shrubs at the back of the bed. Once the garden bed had been reduced in size, the original forsythia bushes that were outside the smaller bed needed to be moved. Another problem was that the forsythia plants were touching the fence line and only arched at the front. The back branches got caught in the fence. So transplanting them was in order. But they were BIG! and we had two of them to move. Since my husband and I had no back hoe, we had to move them ourselves. 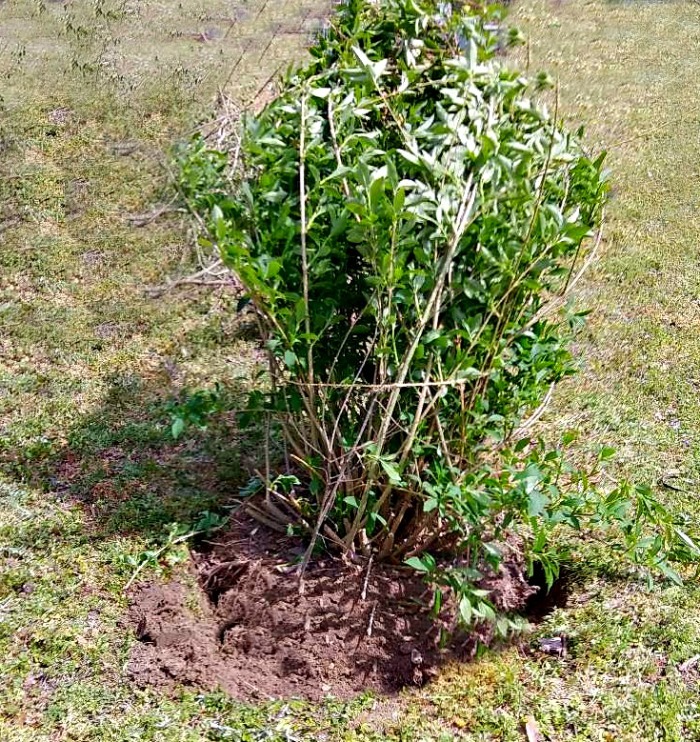 To do this, we used a bit of ingenuity and some grunt work and actually moved the two very large forsythia bushes to the center of our back lawn. They now look perfect. 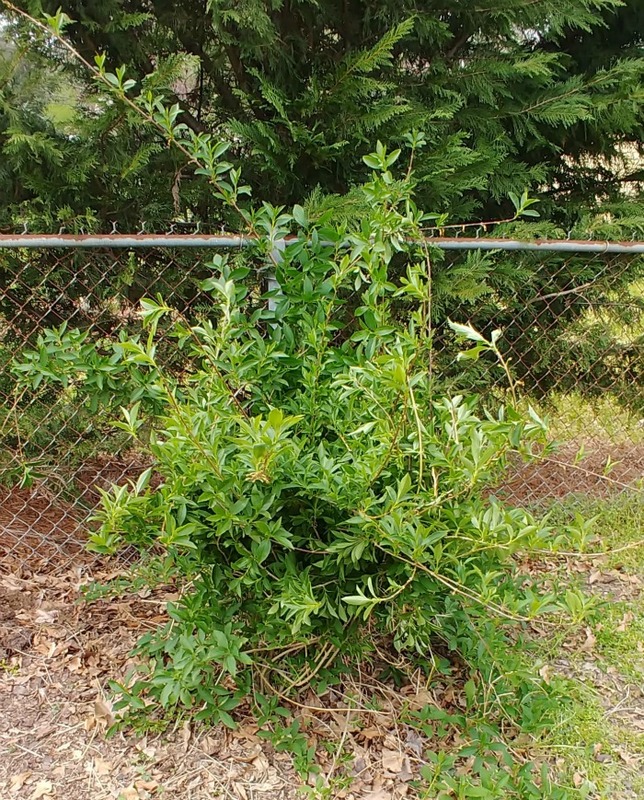 The natural arching habit will enable the bushes to grow unhampered by the fence that used to be behind them, and they break up the back lawn nicely. If you want to do this job, be sure you set aside most of a day. It took us that long to move our two bushes. Here are some tips to make the process easier for you. 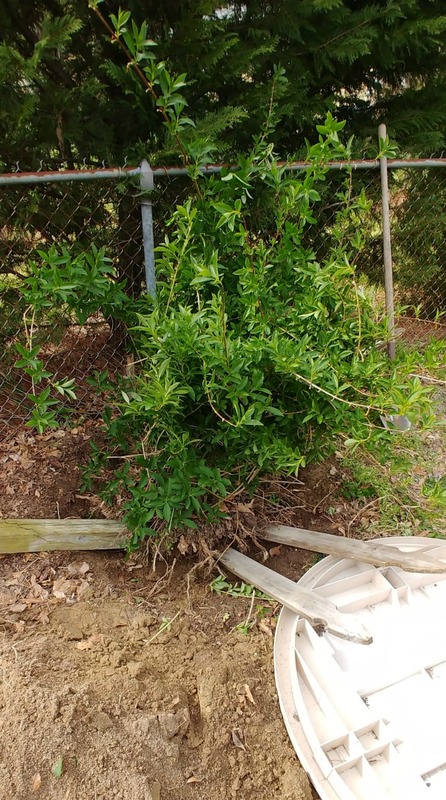 When is the best time to move forsythia? Transplanting forsythia is best done when the plant is actively growing, either in the spring after flowering or in the fall before it goes dormant. I chose spring to allow the roots that get damaged with the move plenty of growth and energy before it gets too hot. It is a good idea to water the forsythia shrub well the day before the move. This will make digging easier and is less harmful to the bush. Transplanting can also be done in the fall when the leaves have fallen off. This makes it easier to see what you are doing. 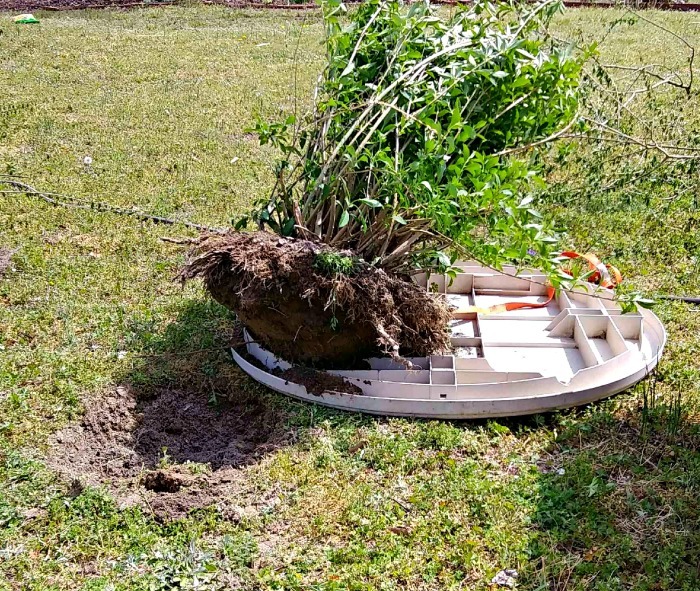 As is the case with moving any medium or large shrub, but size of the root ball will determine the difficulty of the job. 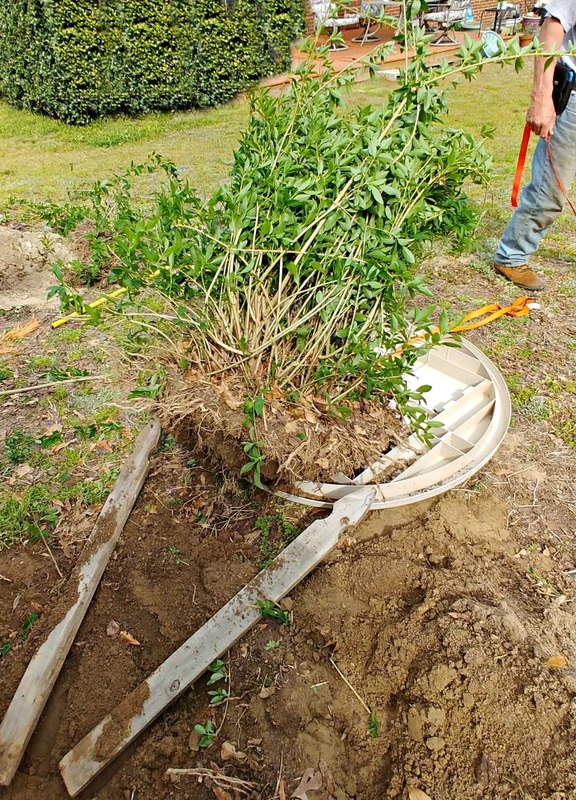 You will want to get as much of the root ball as possible, but really large shrubs can make this a challenge. Start by wrapping the canes of the forsythia bush in a few places with ropes. The canes have a graceful arching habit that is beautiful to view but hard to dig around. Placing a tie around them makes it easier to dig. You can’t see the ropes in this photo, but there are two of them – one low and one fairly high. The ropes pulled up the canes so we could dig freely. Next, proceed by digging a trench about 20 inches out from the base of the plant. This will cut off many of the roots, but don’t worry, forsythia buses are tough and new roots will grow quickly in spring. Digging this trench “prunes the roots.” This cuts the long roots and encourages the plant to send out a new series of roots close to the plants root ball. In younger bushes, you will want to refill the trench with new potting soil and organic matter such as compost. This will allow the cut roots to regenerate in a few weeks, and will give you a head start on new roots. If you do digging in two stages be sure to mark where the outside of the trench is when you back fill, so that you won’t damage the new roots when you dig up the plant later. Choose your new location in a spot which has at least five feet on either side of it free. 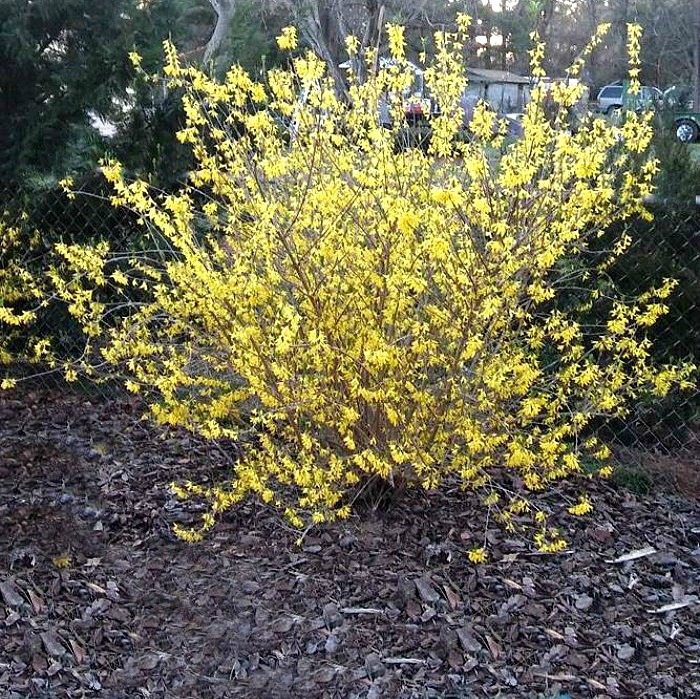 This will allow for future growth and is a good rule of thumb for spacing forsythia. Be sure that the new location is one that will receive sun daily for at least 6 hours. Forsythia shrubs do best in full sun. Be sure to dig your new hole before you try to transplant the forsythia bush. 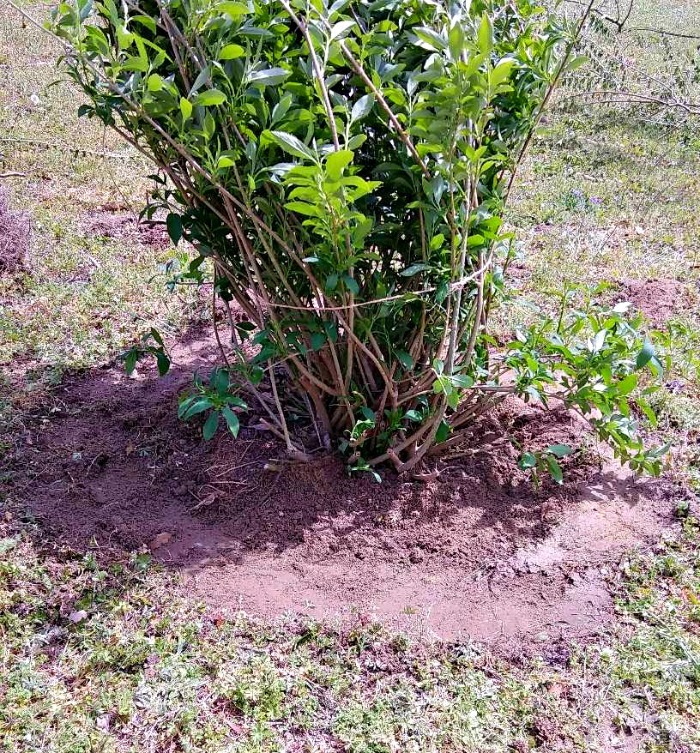 When you move it over, you will want the hole ready to place the dug up shrub, to keep the time it spends away from soil to a minimum. 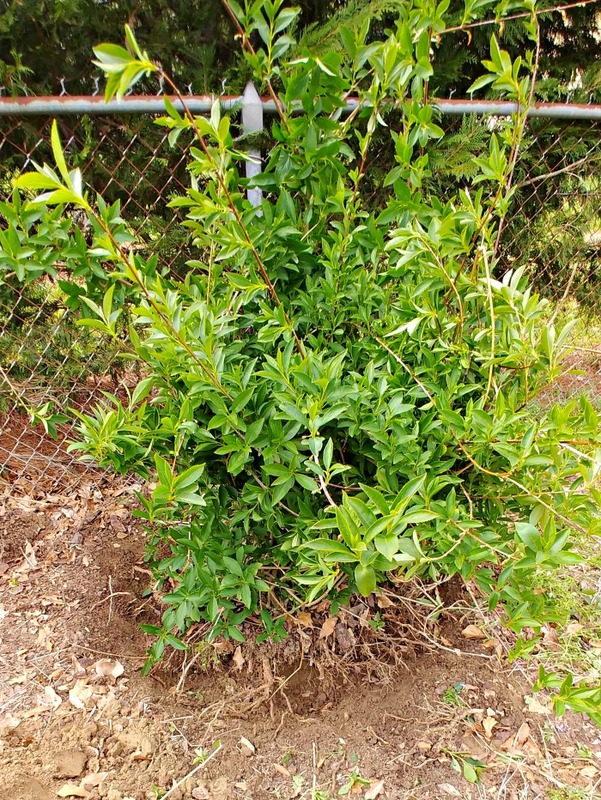 Dig up a hole in your new location that is the same depth and twice the diameter of the root ball of the shrub. 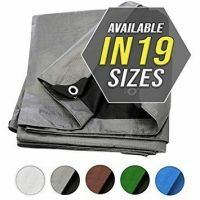 This allows new roots to be able to grow into fresh new soil. This idea came from my husband when we realized just how darn heavy these bushes were going to be. There was no way the two of us could lift them. We had an old round picnic table that we planned to use as a sledge. Richard also came up with the idea of using old planks of wood on both sides of the trench for levering purposes. They allowed us to lever up the root ball easily so that we could continue to dig under the plant to release the roots. They made it easier for us to remove the forsythia bush from its original spot onto the sledge so that we could drag it across the yard to its new spot. Have one person place the two planks in the hole an push under and lever the root ball up while the second person digs some more under the plant to release the remaining roots. Now pull the sledge over to the hole edge and use the planks again to lever the forsythia out of the hole and onto the sledge. We tied the dug up forsythia bush to the edge with some more rope and Richard used a shovel handle to drag the forsythia. Then it was just a case of dragging it across the lawn to the new hole. This step was surprisingly easy in spite of the weight. 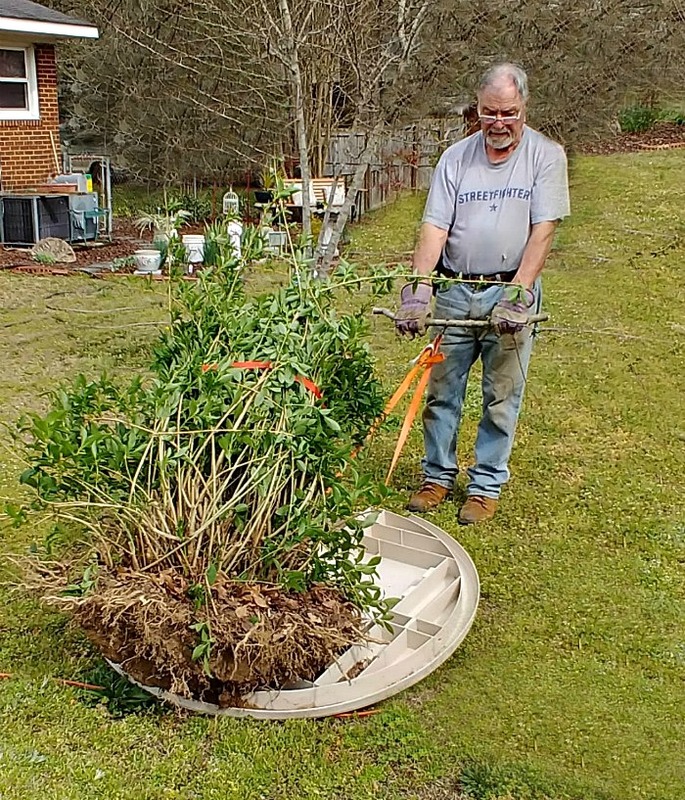 If your plant is smaller, you can use a tarp to place the forsythia bush on and drag it, but the round picnic table gave us a lot of support and made it very easy to move the bush. 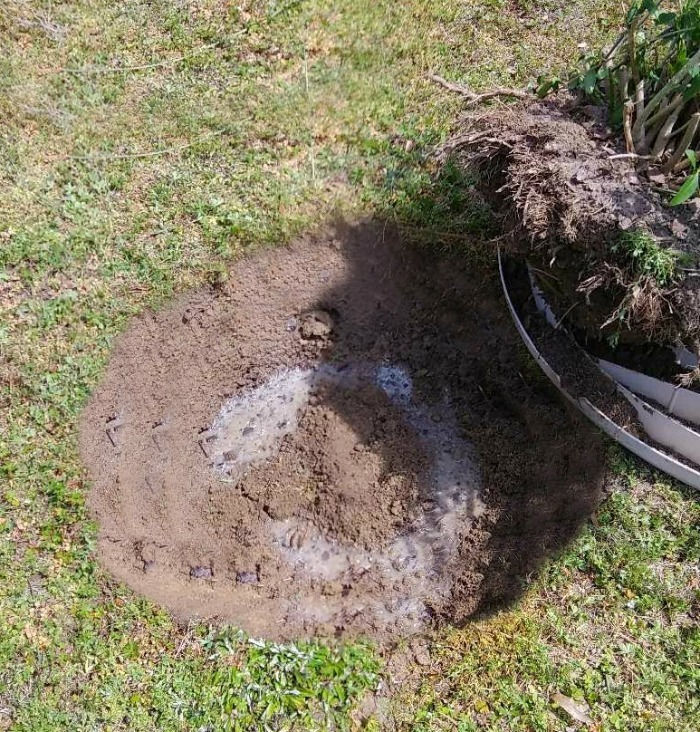 Give the soil in the new hole a good watering and be sure to have some new potting soil and compost or other organic mixture handy to add to the soil after the forsythia shrub is inserted into the new hole. Leaf mold and manure can also be used to amend the soil. This helps to improve the soil drainage and adds additional nutrients to it. Sit your plastic sheet or sledge close to the new hole that you have dug and position the forsythia bush in it. This is a good time to measure the depth to make sure the hole is as deep and wide as you want it to be. Once the shrub is in the hole, it’s hard to get it out! Loosen the roots as much as you can and extend them outwards so they will grow into new soil. 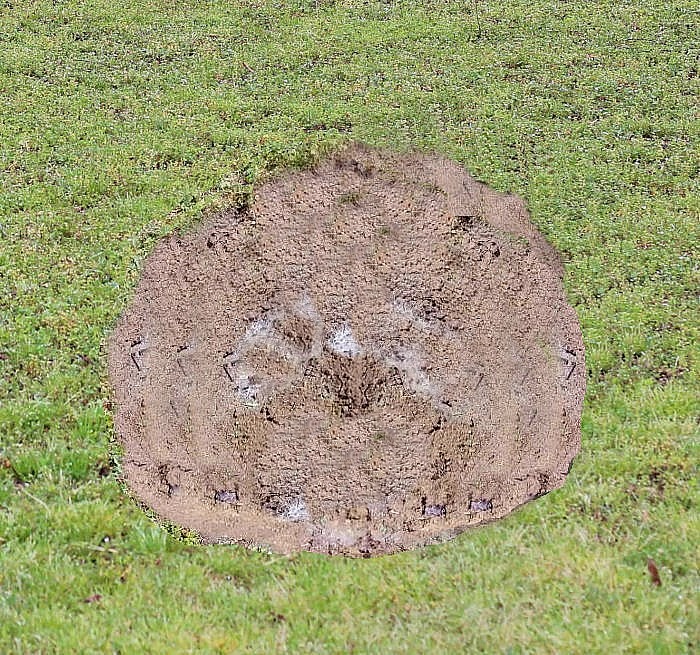 Fill in any areas around the outside of the root ball with your new soil and organic matter. Use the handle end of the shovel to push down the soil and remove air pockets. If you don’t get rid of the air pockets, the soil level will really sink later and you want lots of fresh soil around the root ball, to encourage vigorous re-growth of roots. Water the tree well and continue watering daily for a few weeks while the forsythia shrub gets established in the new location. Continue watering once a week for the first season to make sure the forsythia bush will be well established. We added a border around our forsythia shrubs, since our plants were placed in the middle of our lawn. We didn’t want the grass to crowd the crown and having a border will make mowing the lawn easier. To add the border, measure out from the center the distance you would like and use the space to remove the top layer of grass. Add some fresh soil and use your choice of edging to keep the weeds away from the forsythia bush. 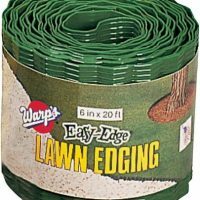 We used green plastic edging that is flexible and easy to form into a circular shape. The forsythia shrubs now look so graceful on the lawn and we were lucky enough to get several weeks of heavy rain after we transplanted them so they didn’t suffer at all from the move. They look as though they have been in this spot for years and I can’t wait until next spring to see the beautiful display of color they will have for us. The shock of transplanting can be lessened by removing a few canes. Trim off those that have split tips. This will keep the arching habit of forsythia intact. When you seen new canes emerging from the crown, you will know that the transplanting has been a success. You should see the plant pick up about a month or so after transplanting. While the job can be done in fall, I prefer to do it in spring, so that the new growth will happen soon. And you can even make the flowering happen sooner, by forcing forsythia cuttings indoors in the winter months! Stay tuned for my next project – a forsythia hedge! Once we made the garden bed smaller, the rest of the forsythia have proven to be too large for it. Instead of moving them all, I plan to turn them into a hedge along the fence line. That will happen in a few weeks! 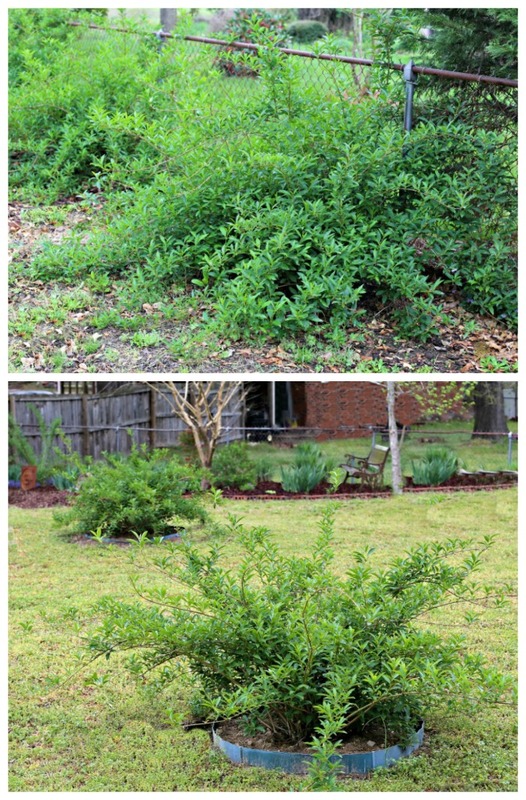 What is the largest size shrub or tree that you have dug up and moved by yourself? Let us know in the comments below. 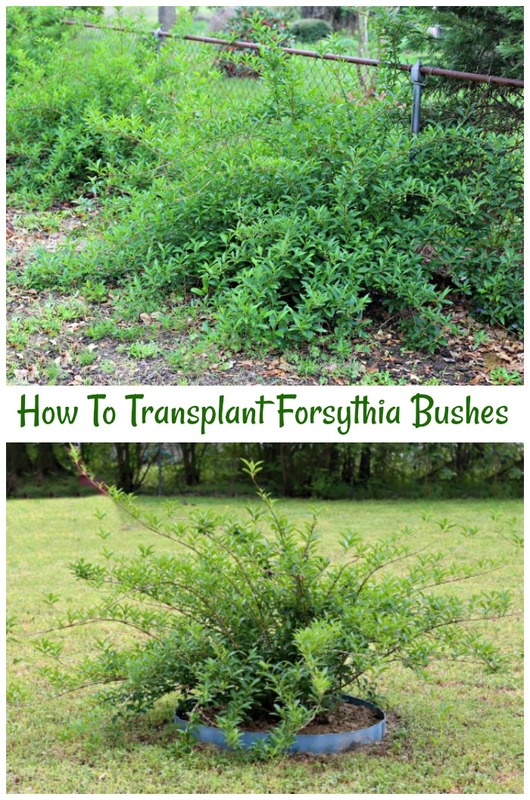 Would you like a reminder of these tips for transplanting forsythia? Just pin this image to one of your gardening boards on Pinterest. Moving an overgrown forsythia bush can be challenging if you don't have the luxury of a back hoe. These tips will make the process easier. Water well the day before digging the bushes up. 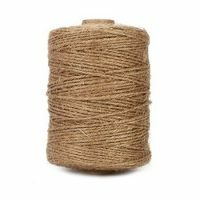 Start by adding rope or ties around the canes to tie them up out of the way. Dig a trench about 20 inches out from the crown of the forsythia. Use the trench to level the bush up so that you can loosen the roots under the bush. Dig a new hold the same depth and twice the diameter of the root ball. Water the new hole well. Get garden soil and compost ready for replanting. Lever the forsythia shrub out of the hole with the planks onto the sledge or tarp. Drag it to the new spot. Place the shrub in the new hole. Add new soil and organic matter around the root ball. Use the shovel handle to get rid of air pockets. 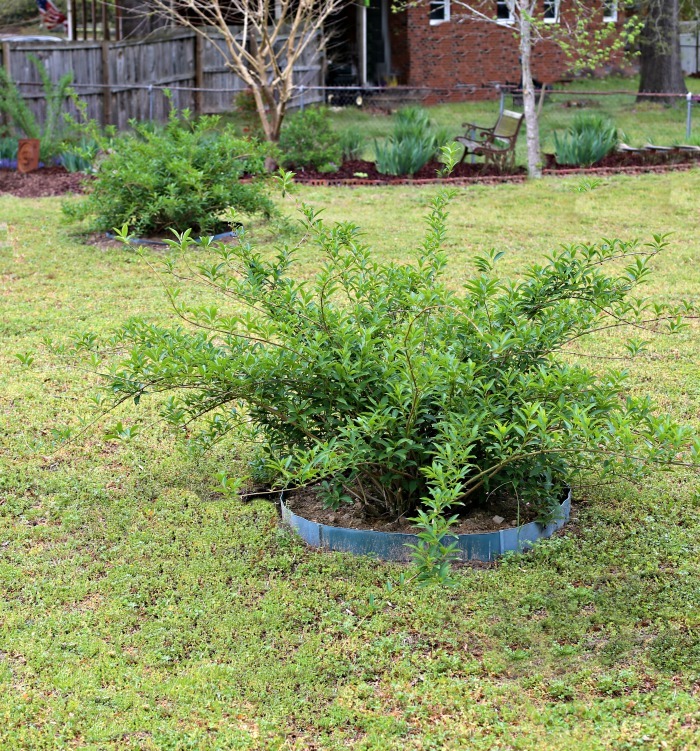 Use the flat edged space to remove nearby grass in a circular shape. Add topsoil. 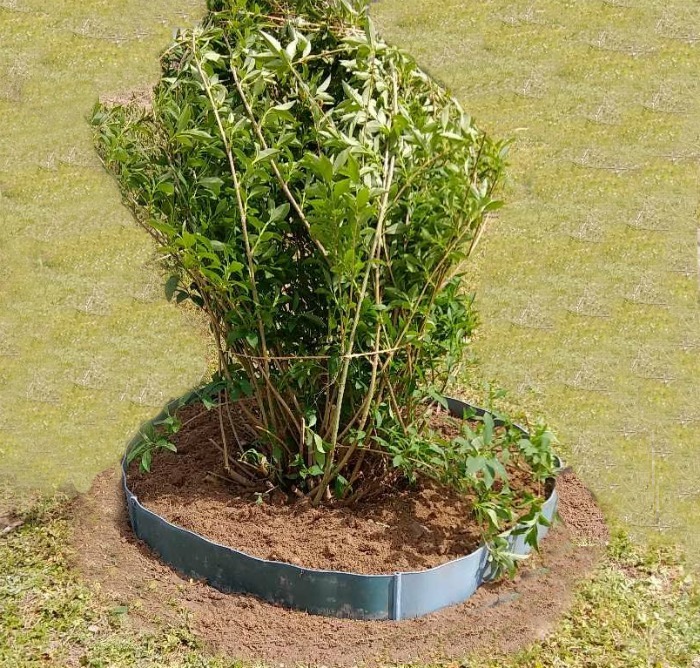 Insert plastic edging around the circular hole to keep grass away from the forsythia. Continue watering once a week for the first season.